Were there any birds about this weekend? The only ones that concerned me were Ravens, Falcons, Seahawks, Cardinals, and Eagles. Welcome back, NFL football! Of course I still kept my eyes out for other types of birds. This time of year is perfect for finding juvenile Eastern Bluebirds, which I was happy to do. Corey’s BBOTW was a Blackburnian Warbler on Saturday in Alley Pond Park in Queens. Fall migration is in full swing! Best bird of the weekend was a marsh harrier low over the house, best flappy flying thing of the weekend was something far creepier…. Also migrant Blackpoll , Tennessee, Chestnut-sided Warblers. 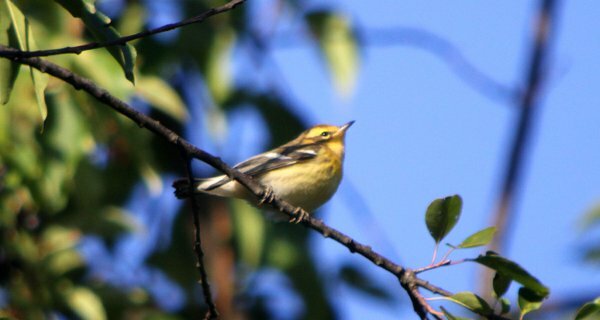 Best bird was also a Blackburnian Warbler yesterday in Saratoga County, NY. It was my second one ever. My lifer was on my birthday two years ago. Yesterday was my birthday as well. Blackburnians are a birthday bird for me! Cape May Warbler at Franke Park in Fort Wayne, IN. I struck out birding, so my best *birds* were a quintet of DB Cormorants flying at sunset as we stood on a rooftop for Rosh Hashanah prayers. But, like Tai Haku, my *best* find was a flying, somewhat creepy creature … the first bat I’ve ever found on my own! It was a Little Brown Bat, I think, and well-camoflouged, clinging to a crook at the base of an office building. Made my day! @Tai: Major congrats on your even huger and creepier find! @Lindsey: Happy birthday, and how awesome to have a birthday bird! About a hundred migrating Red-necked Phalaropes near Marrowstone Island and Port Townsend, here on the Olympic Peninsula. They are delightful to watch on the water. Well, I could put down the Philadelphia Vireo I saw at Alley Pond Park, Queens on Friday morning, a Rosh Hashanah bird. But, the bird that made me the happiest was the Canada Warbler I saw in Prospect Park Sunday morning, a Life Bird for my friend Christina. Christina first spotted it flitting in a low tree by the wood chip pile, and it took me a few minutes to definitely decide that it was indeed a Canada, because the necklace was so faint (darn fall warblers). It then flew to the path, where it picked up grubs for several minutes, giving Christina a nice opportunity to examine it in a Life Bird way. Although I didn’t get out on Saturday or Sunday, best bird from guiding on Friday, Monday, and Tuesday was a Costa Rican Pygmy Owl in high elevation habitats of Poas Volcano. Also had R. Quetzal and Black Guan both days up there but they get trumped by the owl.